If you follow me on social media (check the links on the right! 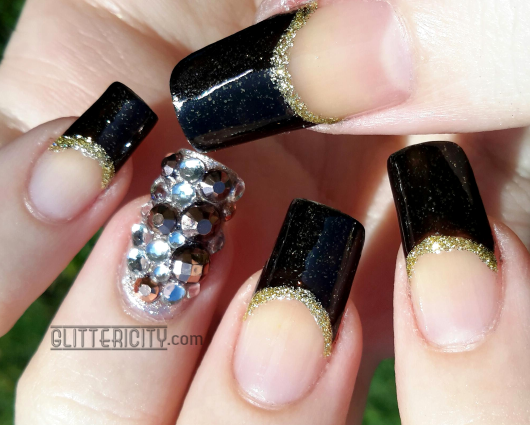 ), you'll already have gotten a peek at these black and gold tips with a super-blingy accent nail! The tips are done with two coats of Twilight Rays from the Maybelline Color Show line. This nice warm-black jelly has pretty gold flecks in it, and I think it's really lovely! I lined the black tips with my gold glitter Stripe Rite striper polish. 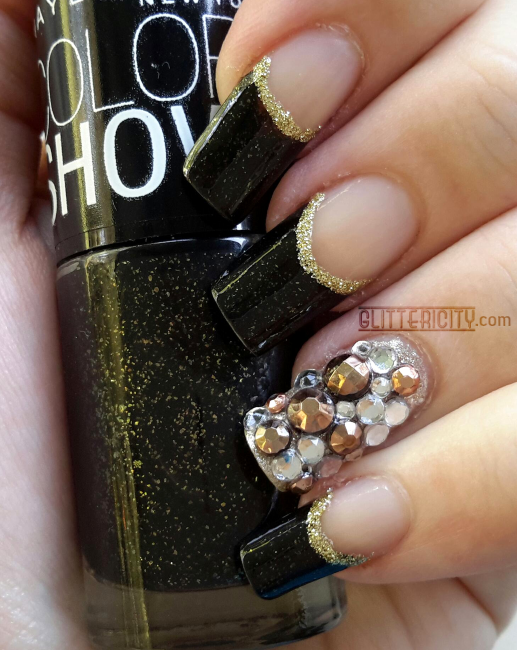 For the accent nail, I used Scene Stealer, a cool gold foil by Dollicious (by Fredericks of Hollywood), and then a coat of Orly Halo (gold and silver glitter) on top of it, so the spaces between stones would be sparkly as well. I then used nail glue to adhere some clear stones in assorted sizes, as well as these nice bronze ones from Cult Nails. Two coats of Seche Vite sealed all this in and made it super shiny. I made sure to coat the stones thoroughly and slowly, pulling the excess off the side with a finger and also making sure there were no bubbles. It worked beautifully, not dulling the gems, and helped them stay on longer. They made it the entire four days I needed them to without a single chip or missing stone, and I actually think it would have been fine several more days, but I added another layer of topcoat thinking it would help continue protecting it. It just made things too thick, and it started peeling off a few hours later. Boo. I hope you love this one as much as I do! 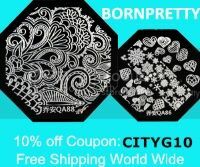 It's a fairly easy design to do and is SO eye-catching.